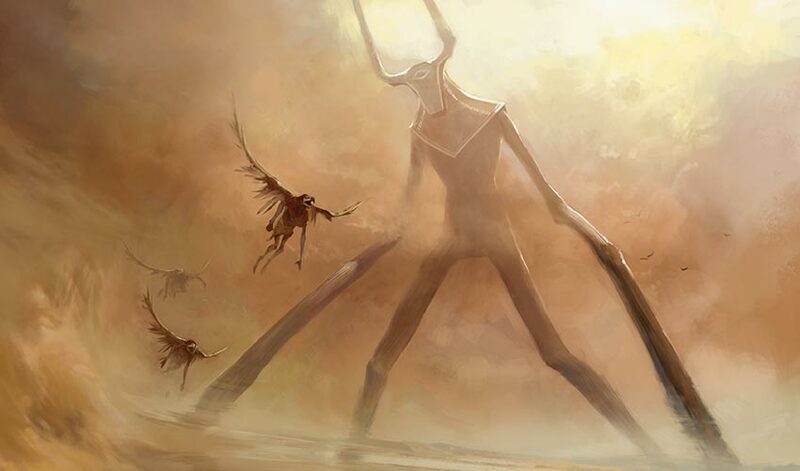 Years before the arrival of the Gatewatch on Amonkhet, the fate and future of three children had unforeseen effects on the destiny of the plane. She found him at the edge of the water. The screech of cranes taking wing announced her presence, and he turned to see her standing among the reeds, sandaled feet spread wide, hands on hips, flashing a toothy grin. "You may have sneaked by the others, Nakht, but you can't escape me." Her voice carried effortlessly across the distance. The young aven boy gave a little flutter of his wings, the girl's happiness spilling out and washing over him. "I couldn't sleep," he said, wading out of the river. She nodded. "I know. Me neither." Nakht snorted as he reached her, his bare feet squishing on the rich silt of the bank. "Please. I heard you snoring like a roaring sandwurm as I walked by your cot." She laughed. "Hey! I was, uh, just pretending to sleep, dummy." Nakht fixed her with his best impression of a stern vizier's stare. "Samut: queen of snorers, worst at telling lies." Samut gave him a playful shove, sending him stumbling back into the water, wings flapping for balance. A surprised yelp melted into a playful trill, and he crouched in a defensive stance, water lapping at his knees. Samut's eyes lit up at the invitation. Her feet shifted instinctively as she assumed a grappling pose, ready to spar. Even though they were the same age, Samut stood nearly a head taller than Nakht. She was faster and stronger and had the high ground. Against any other opponent, Nakht knew picking a fight was foolish. But Nakht also knew Samut. She sprang to action, charging down toward him, crossing the space between them with surprising speed. Water splashed as she lunged at him. Nakht ducked, his body dipping toward the surface of the water, weight centered and grounded. Samut stumbled in her haste, hands swiping at air as she lost her balance in the sinking silt of the river. Nakht thrust his hands into the water, grabbed her leg, and pulled. Samut disappeared with a yelp and a splash, dunked underwater. His advantage was short lived, though, as Nakht felt a strong hand grasp his arm and went tumbling under the surface as well. For a moment, all was bubbles and frothing water. Then two heads broke to the surface, Nakht shaking the water from his feathers as peals of laughter rang out from Samut. She stood up in the water, her short, dark hair matted and wet, framing her round face. "Dang it, Nakht! I'll get you first one of these times!" "Unlikely." Nakht paid for his quip with a face full of water. "You'd take him down first every time if you paused to think before you leapt to action." Samut and Nakht turned in surprise. On the shore, Djeru stood watching them, attempts at appearing stern betrayed by the smile in his eyes. Samut splashed water in his direction. "Stop trying to act so mature, Djeru." Djeru nimbly stepped back, far out of range of Samut. "We should be preparing, not playing in the river." "Hey, no one asked you to follow us here," Samut said. "Someone has to keep you two out of trouble." Samut rolled her eyes as she waded out of the river. With a flap or two of his wings, Nakht flew ahead of her to the shore. "I just . . . wanted to get away and think," he said as he landed. "Be by myself, for just a moment." He walked into the reeds to fetch where he'd hidden his sandals, and when he turned back, he saw Samut standing, her face slightly crestfallen. "Oh," she said. "Sorry. I didn't mean to interrupt—"
"No, no, it's fine! I didn't mean to say it like that. I don't mind you two being here. Honest. It's . . . nice knowing you guys have my back." Nakht shook his head. "It's just—today's our Harvest." His gaze drifted out across the river, back toward the rest of the city. Naktamun stretched before them, proud monuments and towering buildings looming far into the distance. The red-orange glow of the second sun, low on the horizon, glimmered off the structures. Small felucca boats drifted along the river, white sails cutting sharp angles across the horizon. The first sun peeked just barely above the distant horizon, still hidden behind the temple of Hazoret, its golden rays casting a halo of light around the darkened silhouette of the temple. Every day, for as long as Nakht could remember, the anointed caretakers took him and the other children to the high gardens to view the city. Every day, their vizier teachers would lecture them. "Appreciate the beauty and wonders of Naktamun," the viziers said. "Witness the blessings of the Gods that made it possible." Every day, it seemed, a new temple or grand shrine would see completion, testaments to the gods and to the awaited Hours. The Viziers' lessons all spoke of the people's true purpose. 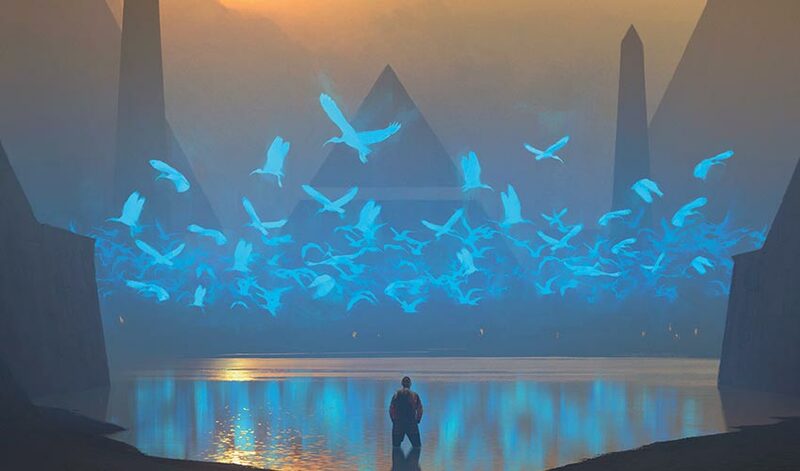 And now, on the Day of Harvest, as they turned twelve, he, Djeru, and Samut would take their first steps toward their destined paths, toward discovering their fate and part in this grand city. Samut ruffled the feathers on Nakht's head. "It's an exciting day, Nakht! It's finally our turn! Today, we leave childhood behind and step up to join those who have gone before. It is a day of beginnings, of purpose and unity!" Nakht nodded, familiar with Vizier Ahmose's words. Yet he couldn't shake the gnawing sense of worry that lingered in the pit of his stomach, as it had when he left their sleeping quarters earlier that morning. Djeru sighed. "We should get back, you two. The others are surely waking up now. I imagine there are preparations still to be made." He deftly dodged the mud clod Samut threw his direction and turned around, tromping along the bank back toward the heart of the city. Nakht lingered behind. Samut walked up to him, too close, fingers still dripping with mud, and leered into his face. "You're worried," she declared. The two descended into their best Vizier Heqet impressions, wagging fingers and shaking their heads. "I hope you find more focus in your training." "I hope you learn to trust your instincts." "I hope we get to stay together." One of his fears escaped Nakht's mouth and lingered in the air. Samut stopped mid finger wag, her eyebrows raised in surprise. Nakht stumbled on. "You, Djeru, and I. I think we are good together. And . . . I would miss you both." Samut straightened and nodded, and Nakht felt the weight on his chest lighten, just a bit. "Me too." Samut's gaze flitted back toward the city. "I want to strive for the Afterlife with you and Djeru by my side. But even if not . . . even if we ended up in different crops, Oketra will guide us true. 'I place my faith in the gods, whose faith is in the God-Pharaoh.'" Nakht nodded at the familiar incantation. "May he return quickly and may we be found worthy," he said. Then, the next words tumbled out of him, spurred by the escape of his other fear. "But what if . . . what if I have questions?" He broke away from Samut's gaze, averting her questioning eyes. "What if my faith falters?" The silence between them stretched, and Nakht wondered if he'd made a terrible mistake. Finally, Samut spoke. "You're no dissenter, Nakht." Samut's voice was low and quiet. "We all fear. We all falter. I too have had questions." Samut pointed to the sand dunes just a short distance away. "But even the great Hekma is not impenetrable. We've heard stories of monstrosities sometimes wandering in." Nakht nodded, his eyes tracing the shimmers of the barrier that kept them safe from the wastes beyond. Hot sand, swirling in wild storms, pushed high just outside the barrier, stopped by the powerful magic. Just steps from the dry and dead dunes, lush greenery flourished, nurtured by the Luxa river. Samut took a slow breath in. "But I know the gods are true. They keep us safe from those horrors. And they guide us toward glory. It's like Vizier Heqet says. I mean, it's like he says, in between yelling at us. 'To have faith is to question, to gaze into the face of doubt and find renewed truth.'" Nakht shook his head. "You paid more attention to lessons than I gave you credit for." A smile crept back on Samut's face. "Like I've said: I just pretend to sleep." Nakht gave her a shove and ran to catch up to Djeru who had stopped at the bridge ahead, waiting patiently for them. Samut quickly sprinted by the two boys as the first sun crested over the distant temples, and even Djeru joined as they raced back, Nakht's anxieties melting away in the heat of day. "Nakht. Hey Nakht." A little louder, a little more urgency. He stayed still and silent. "Nakht. Nakht. Nakht. I said, Nakht." Nakht's bed shook until he turned over on his cot, his wings crumpled beneath him as he stared up into Samut's eager face. Nakht suppressed a laugh at Samut's earnest question. "No," he said, and rolled back onto his side. "Oh shush," she said, pulling on his arm. Nakht rolled back, sitting up. "Couldn't sleep," Samut said as she plopped down next to him. "None of us can, thanks to you Samut," grumbled a voice in the dark. Djeru's face emerged in the semi-darkness, grumpy and wrinkled into a yawn. As if to prove his point, a voice from a nearby cot mumbled, "Shush, you guys." A few other voices muttered their support, and behind Djeru, Nakht saw the shape of several anointed walking slowly toward them. He put a finger to his beak and grabbed Djeru and Samut's hand. The trio ducked down and crawled their way under the cots and bunks, pausing to let shambling bandaged feet go by. Once they got as close as they could to the main doors, they rolled out and dashed for freedom. The anointed caretakers didn't notice as they cracked the door open, a flash of nighttime red light dancing across the rows of cots before the three of them slipped outside to freedom. Behind them, the Children's Quarters loomed large and mildly ominous, the crimson light of the second sun casting deep shadows across its façade. They quickly ducked down a side alley and came to a fountain adorned with a statue of Kefnet—their usual spot where they hid on the cool nights when they snuck out of bed. Djeru let out another yawn, and Samut cuffed him on the head. "Were you really actually sleeping? How can you not be excited?" She looked at him incredulously. "For your information, I can sleep and still feel excited," said Djeru. Samut rolled her eyes. "You're so boring, Djeru." "Sorry, Samut, but I'm with Djeru on this one," Nakht offered. "Tomorrow we begin our training as disciples. We'll want to be well rested." "Sleep is for the unambitious! We are Djeru, Nakht, and Samut of the Tah crop!" Samut puffed out her chest. The boys groaned, but beneath their surface blasé attitude, an electric excitement hummed. Samut pressed on. "Setha and Besetha are in our crop, too. I can't wait to meet everyone and start training together!" Djeru nodded. "That's all swell, but I imagine Nakht will have more training separate from us." Samut frowned. "What, you mean like more flying lessons and such?" "Were you not paying attention during the Harvest? Nakht received a staff while we received khopeshes." Djeru smiled at Nakht. "It seems you've been keeping a secret from us." Samut gave Nakht a quizzical look, and Nakht's feathers at the crown of his head ruffled in mild embarrassment. "It's not really a secret. I just haven't had a chance to tell you guys. And it's not like I can really control it yet." 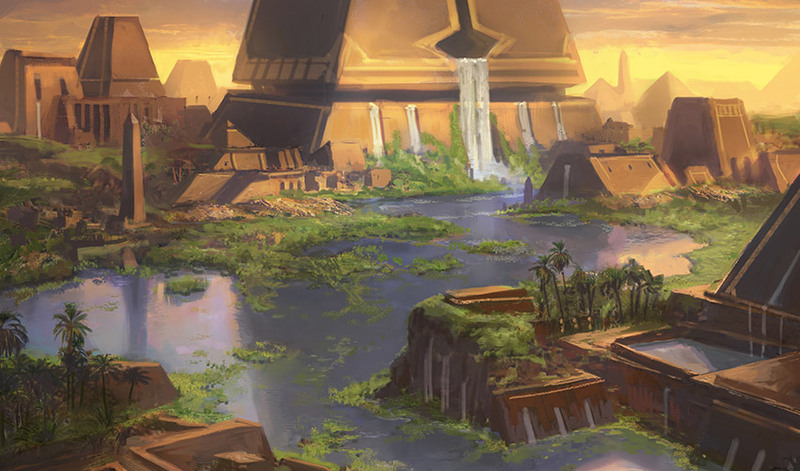 With a glance at Djeru, Nakht turned his focus to the fountain behind them. He reached out a hand, took a deep breath, and closed his eyes. In the darkness, he heard the burble of water, followed by Djeru and Samut's gasps. He pulled with his hand and pulled with his mind, opening his eyes as a small gush of water swirled sprang from the fountain and danced around his fingertips. The water flowed in surging ribbons, never quite touching his skin, swirling to form a small sphere in his palm, wobbling briefly before bursting like a plump grape. Samut let out a low whistle. "That's incredible! How did you—when did you realize?" Nakht put his hand into the fountain, enjoying the coolness of the water. "Only recently. I found when I moved in the river, the river sometimes . . . listened and followed my lead." Djeru smiled. "Everyone says it's important to have mages in a crop. You'll make ours all the stronger with your skills." "I'm so glad we got to stay together. The three of us will be unstoppable!" Samut grabbed Nakht in a headlock and mussed his feathers. Nakht laughed and squirmed out of her grasp, only to knock into Djeru, accidentally pushing him into the fountain. Djeru clambered out, sopping wet, his face dour and annoyed. Samut doubled over, giggling at the dripping Djeru—until Djeru lunged and threw her in the fountain as well. The three descended into a tumble of playful pushes and shoves, trying to stifle their laughter in the quiet of the night. After tiring themselves out, they sat along the edge of the fountain, catching their breath. Suddenly, Samut stood and turned to the two boys. "I have a secret too," she declared. And she was off, dashing into the night. Djeru and Nakht looked at each other, shrugged, and ran to follow. Nakht had never been to this part of the city before. Samut had led them there through a series of twists and turns, ducking down narrow alleyways, leading into a forgotten district, far from the center and from the main monuments. Once, Nakht suspected, this area had housed barracks, but as new living quarters were built, it appeared much of the old housing was abandoned and forgotten. The buildings that still stood in this district were old, worn with sun and time. Newer layers of rooms and roofs hid the more dilapidated remnants of structures from bygone years. As they went deeper, even the hieroglyphics on the walls looked different than what Nakht had studied, with many symbols he didn't recognize. He had taken flight to keep up. Samut ran with a speed and endurance that few could match, even among the older children. Djeru was one of the few who came close. Nakht knew Samut had slowed down for him, but even then, he found himself out of breath as they arrived, the narrow pathways opening up into a small square. "What is this place, Samut?" Djeru wheezed a bit, wiping sweat from his face. Samut waved at a massive mural on an old and crumbling wall on the far side of the square. The paints were faded, the carved portions worn nearly flat. "I'm not sure, but it's old. Really old. It's probably older than anyone we know." Nakht walked up to the mural, eyes squinting as he tried to decipher its meaning. The painting illustrated figures in various stances. Some looked almost familiar, like a few of the combat poses taught by the viziers, but many others didn't make any sense. There were also more glyphs and runes that Nakht couldn't read, interwoven with familiar ones. Even the ones he could read carried odd flourishes and deviations, resulting in a very different style and look. Djeru looked a little uncomfortable. "The gods teach us not to dwell on the old, on things that have passed. The Trials and the Afterlife all lie ahead of us, not behind." "But look—the gods are here too! On these old murals. There's Hazoret." Samut pointed at a tall figure in a painting, and Nakht realized that was indeed Hazoret—but she looked different, rendered in a style foreign to what he'd seen on everything else. Hazoret gazed over the smaller figures: humans, aven, khenra, minotaurs, and naga, all standing in various stances. "What do you think they're doing?" Nakht asked, pointing to the strange poses. Samut smiled. "That's my secret. I've been trying to figure it out. I think these are old fighting stances, or movement forms, or something." With that, Samut assumed the first stance on the mural: a sturdy, familiar posture, with feet squared for balance. As she began to move, though, her body flowed with a rhythm and heartbeat unlike any of the fighting forms, fluid and lithe, strong yet flexible, a reed bending in the wind. 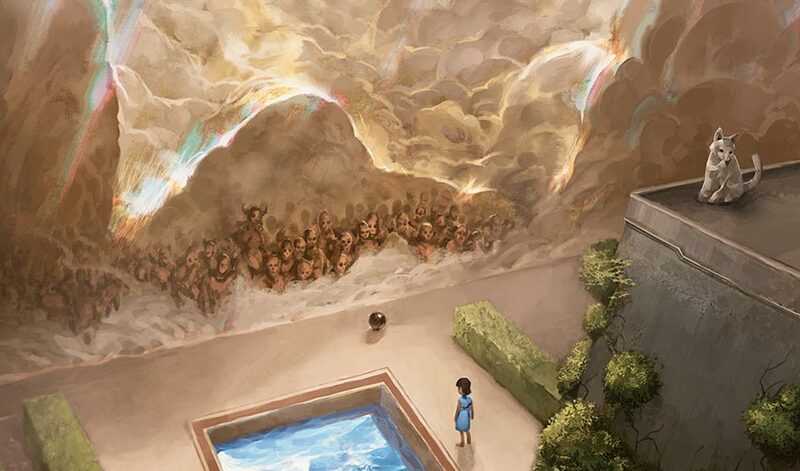 She hit each pose depicted in the mural, her feet stirring the dust as her gestures stirred a flitting recognition in Nakht's mind. She moves much as I fly, he realized—muscles driven by primordial instinct more than thought, ancestral memories passed down through something deeper than just words or even blood. Samut stopped, jarring in her sudden stillness. "That's about as much as I've got so far," she confessed. "That was . . . beautiful." Nakht smiled. Samut blushed. Djeru coughed. "I wonder if this is an old temple to Hazoret," Samut changed the subject. "It just feels . . . important, somehow, you know?" "I don't know," Djeru interjected. He walked up to Samut, staring at the mural, his face etched with suspicion rather than wonder. "If it is, why is it abandoned? Why do the art and glyphs look so strange? Maybe . . . maybe we're not supposed to be here." "You're always such a spoilsport." Samut punched Djeru in the arm. "I just think you should be careful," he said, rubbing the bruise already forming. Samut snorted. "You could loosen up a bit, Djeru. Kefnet demands initiates to ask questions and have an inquisitive mind." "Oketra teaches a crop should have discipline." The two fell to squabbling, quoting the gods and calling each other childish names. Nakht ignored them as he traced his hand on the faded mural, lingering at the feet of the painted Hazoret. "It almost makes you wonder," he mused out loud, "if there ever was a time before the gods." The sudden silence snapped Nakht out of his thoughts. He turned to find Djeru and Samut both looking at him. "The God-Pharaoh is eternal." Djeru raised an eyebrow at Nakht. ". . . may he return quickly, and may we be found worthy," Samut said. "Thank you. Yes." Nakht rustled his wings. Djeru frowned. "It's just—well, if the God-Pharaoh is currently gone, was there a time before his first arrival?" Nakht could feel the growing unease from Djeru and Samut, but he pressed on. "If he taught the gods, and the gods teach us, who taught him before?" "The God-Pharaoh doesn't need teaching. He is the source of all," Djeru answered. "That's the first thing we learned in our lessons." Samut let out a low groan. "Please don't encourage him, Nakht. I barely survived this lesson from Vizier Heqet, I don't think I could survive listening to Djeru explain it poorly." The tension dissipated and Djeru laughed while Nakht smiled weakly. ". . . Anyway, now you know my secret." Samut threw a punch at Djeru. "Your turn." "Nakht and I each shared a secret." Samut nodded solemnly. "It's only fair that you share one." Djeru looked perplexed. "I don't have any secrets," he said. "That's a lie," Samut said. "I know even you aren't that boring, Djeru." Djeru thought for a moment, then his face lit up. "Well," he said, "it's not really a secret. I mean, it is, but only because I haven't had the chance to tell yet." "Stop being mysterious and show us!" Samut poked Djeru in the chest. Djeru smiled and walked quickly out of the square. Samut kept pace right behind him. "So . . . I guess we're just not sleeping at all tonight," Nakht said to the back of their heads. Nakht stared, not believing what he saw. He reached a hand out and felt the semi-translucent barrier of the Hekma, shimmering and incandescent. Although woven from powerful water magic, the barrier felt solid, impenetrable, a wall powerful enough to stop the sand and shadows that stalked the wastes. From the other side, Djeru waved, smiling mischievously. Samut and Nakht watched as he dropped prone and crawled toward them, working his way through the near-invisible hole in the Hekma. Soon enough, he was standing next to them again, the only evidence of his passage the small trail he left in the sand and the scalding air blasting against their shins. "We have to go out there," Nakht said. His words instantly wiped the smile from Djeru's face. "No way," Djeru said. "We should tell the viziers of Kefnet so they can patch the hole." "What good is a secret if you tell it right away?" Nakht asked. Djeru vehemently shook his head. "I told you, it's not a real secret. I found the spot yesterday when I was looking for you two and simply haven't had a chance to tell anyone yet." "So another hour or two won't hurt." Even Nakht was mildly surprised at the words coming out of his beak. But Samut's mural had stirred something within him. "I want to know what's on the other side." Djeru's eyes narrowed. "We do know what's on the other side. Monsters, wandering dead, emptiness, and wastelands. It is where the angels take dissenters so that our focus and devotion may be pure." "We know what we've been told about what's on the other side," Nakht countered. He knew how his words sounded, but he pressed on. "I want to look for myself. Before we begin our path on the Trials." "I'm not sure you know what you're saying." Djeru's eyes had widened as Nakht talked, and he shook his head fervently. "You're sounding like, like a—"
"A dissenter. I know." Nakht blinked, and was surprised to find tears forming in his eyes, suppressed fears bubbling to the surface. "I'm not. At least, I don't think I am. I love the gods—when Oketra walked among our class, I felt so happy. When Rhonas watched us train that afternoon, I felt pride and strength I never knew before." He looked out beyond the barrier, felt the hot winds sweeping at his feet. "But my heart is still filled with questions. That mural filled me with so many questions. All around us, as the gods and the viziers provide answers, I see only more questions. I am full to bursting, and . . . I need to know. I need to see it, to find it, for myself." "What do you expect to find?" Djeru tried to sound stern, but Nakht caught the waver in his voice. "I don't know." Nakht laughed and rubbed his eyes. "It's probably dumb, it's probably nothing but . . . when are we ever going to get a chance to look for ourselves again?" The three stood at the edge of the Hekma, watching the churn of sand. Finally, Samut spoke up. "You're the least dumb person I know, Nakht. And . . . I want to know too." She turned to Djeru. "We'll be careful, and quick, and back long before morning. Who knows; maybe we'll find something to bring into the beginning of our training as disciples of the Tah crop." She gave Nakht's shoulder a squeeze, flashed a smile, then dropped to her belly and began crawling through to the other side. Djeru watched her go, his face etched with worry, but didn't call out to stop her. Nakht put a hand on his friend's shoulder. "You don't have to come, Djeru. I would not fault you." He turned and crawled after Samut. From behind him, Nakht heard Djeru sigh. "Vizier Heqet would kill us for this." "Good thing he's not teaching us anymore," Samut shouted from ahead. The heat pressed down on the trio, unrelenting. Even though it was still night, the warmth from the lone sun still had all three of them drowning in sweat. They had walked for an hour or so through the sand, always keeping Naktamun in their sights behind them. Djeru looked on edge, but Samut seemed genuinely excited, and her energy helped loosen the growing unease grasping at the group. For a while, it seemed everything the viziers taught them had been true. They trekked through a dead world, nothing but sand beneath their feet and scalding winds at their backs. Even so, they stayed alert, stories of monsters and cursed undead pressed against the Hekma playing in loops within their heads. Nakht spotted it first, what appeared to be just a stony outcropping in the sand. Some rock, jutting out like a wayward splinter. They walked toward it, more to have something to walk toward than anything. Once they reached the stone, Samut clambered up, ran along the length of it, jumped off the other side—and let out a surprised yelp. 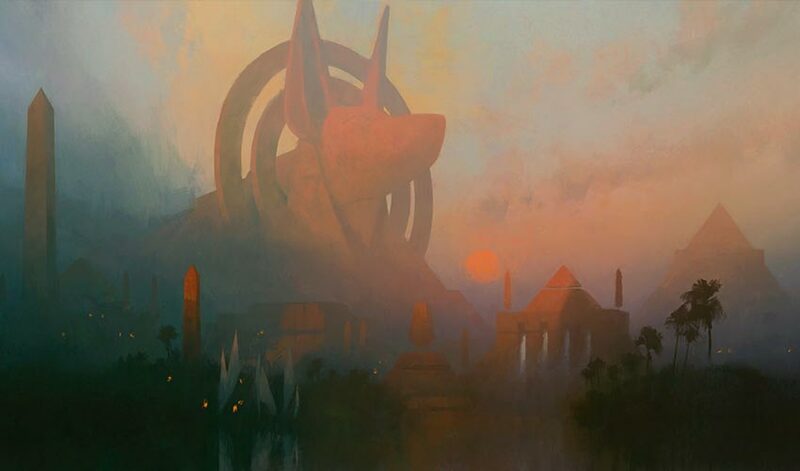 Djeru and Nakht ran forward and saw what gave her a jolt—one enormous eye peered out from just above the sand, the half-buried face of a giant stone statue gazing eternally off into the distance. Beyond the buried statue, a minefield of ruins poked out of the sand. Most of the stones were worn smooth by sun and wind. On some, remnants of glyphs and writing remained. They walked among them, pausing at the various stones, trying to guess what they used to be. The roof of some building, maybe training quarters. Some kind of abandoned temple for a god, the figure still etched on a broken pillar, towering above the humans below, but its face sanded into an unrecognizable blur. Most fragments and protruding bits of stone were impossible to distinguish. Samut soon descended into guessing outlandish things for each ruin they came across. "Well," Djeru said, shaking his head at Samut's suggestion that a stone slab was flooring for a room made entirely of chamber pots, "If nothing else, this is proof that without the God-Pharaoh's blessing of the Hekma, all else withers away." Looking around, Nakht couldn't refute Djeru's point. Suddenly, Samut shoved them behind the remnants of a wall, pressing them flat against the hot stone. Their protests hushed at the wild, fearful look in her eyes, and the unexpected sound of shifting sands. Nakht slid slowly to the edge of the wall and peeked around. In the far distance, a looming . . . thing shuffled across the sand. Towering taller even than the gods, its bizarre limbs seemed to extend forever, knocking dunes flat and reshaping the sand around it as it stalked the horizon. A strange, low moan reverberated through the air, sending shockwaves rippling through the sand and resonating in their stomachs and their bones. Nakht turned back to Samut and Djeru. "What in the name of the gods is that thing?" he whispered, eyes wide. "Don't care, don't care to find out." Samut looked around the wall on her side, watching the thing's movement. Suddenly she dashed forward. Djeru and Nakht scrambled after her, and they all slid down a dune toward a shallow, fetid pool of water—remnants of what must have once been an oasis. They didn't stop running until they had crossed to the other side and ducked within the remnants of a shrine. The tiny stone structure still had all four walls, though its roof was long gone, destroyed in some past calamity. Samut and Djeru stood by the entrance, holding the decaying wooden door open just a crack and peering back toward where they spotted the monstrosity. "Okay. Endless heat. Sand. Destruction. Desolation. Crazy monsters and demons." Djeru listed the things off on his hands. "The desert wastes are everything we've been taught. Are you two happy now? Can we go back?" Samut saw it as well, and looked questioningly at Nakht. Nakht shuddered. The word felt like a bad omen, a curse reaching out across time from the God-Pharaoh himself. We should not be here, he thought. "I'm sorry, Djeru. You were right. We should not have come." Another involuntary shiver rolled down his spine despite the oppressive heat. Samut turned her attention back outside. "Let's get back to Naktamun before—what are those?!" Samut opened the door further so they could see. Immediately, Nakht wished she hadn't. From the stagnant water and the surrounding sands, rotting corpses started to rise. Humans, jackals, aven. Angry moans rose from their dry, desiccated throats as they shambled out of the water, out of the sand, awakening and surging toward the three children. "Dissenters," Djeru backed away from the entrance, his face a frozen mask of horror. "Returned by the curse of wandering." Samut slammed the door shut just as the first corpse rushed at them. The thin wood cracked and rattled at the impact, and Djeru quickly charged to help hold the door against the monstrosities. Claws and dead hands raked and tore at wood, and the moans reached a dull roar as more gathered on the outside. "We're trapped!" Samut cried. Nakht backed away from the door just as one clawed hand punched through. Djeru yelled and ducked as the hand swung about wildly, searching for flesh. Nakht spread his wings and leapt up. With a few flaps, he cleared the shrine walls, gaining a clear view of the mass of risen dead below. He gazed down as more of the risen charged the tiny stone shrine. There was no way Samut and Djeru would hold their position. He had to do something. Through the haze of fear and doubt and panic, the fleeting shape of a plan flitted through his thoughts, and he latched onto it. It wasn't a good plan. But desperation didn't leave him any time for alternatives. Nakht dove down, flying through the throngs of risen, close enough to grab their attention. Decaying claws and withered hands gnarled into stumps swung at him. He flew back over the water, letting loose a piercing screech, pulling their attention from the shrine and onto himself. As the throngs shifted, he shouted out to his friends. The door flew open, knocking aside the few straggling risen still by it. Samut and Djeru dashed out. The first of the risen hit the water with a splash, and Nakht turned his attention back to the swarm now charging him. He flapped his wings hard against the dry desert air, staying just out of reach of their grasping hands and claws. When most the mob was in the water, he took a deep breath, raised his hands, and closed his eyes. Beneath him, the shallow water churned and began to swirl. Kefnet, grant me wisdom; Rhonas, grant me strength, he prayed. His eyes flew open and Nakht clenched his hands into fists. The stagnant waters beneath him swirled into a whirlpool and tendrils of water broke the surface, lashing at the risen below, knocking some down and pulling others under. Nakht looked up and saw Djeru and Samut still standing just outside the shrine, staring with a mix of terror and awe. "Come on, let's go!" he shouted. He kept his hands held tight, trying to maintain focus as he flew higher, back toward his friends standing in the sand. Finally, Djeru and Samut turned and began running back in the direction of the city. Nakht started to dive after them, the moans and cries of the horde a dull roar beneath him. Suddenly, a dread fell over his entire body, and all his muscles seized. Beneath him, the water stopped churning as he lost his hold of the spell, but all the risen stood frozen as well. His wings flapped on, but he didn't—couldn't—fly forward. Panic descended, his mind screaming to move, to flee, to do something, but his body refused to obey. Slowly, with a scream tearing in his thoughts and squeaking out his throat in a feeble squawk, he turned his head to look behind him. The great horror he saw earlier loomed, standing at the crest of the large dune in the distance. Its face—or where there might have been a face—gazed in his direction. Icy shards of dread ran through Nakht's body. He blinked, his wing muscles burning with the strain of flying in place. When he opened his eyes, the horror stood right in front of him. Mask-like bone where a face should have been. A glowing rhombus of light for an eye. Endless void, darkness for a body, shifting horror and roiling despair. An impossible appendage reached for Nakht, almost ponderous and drifting in its path. The cacophonous cries of aven voices rang in his ears, and out of the corner of his eyes, he saw undead bird forms float and flit, gnats around a corpse, gifting eternal voices to the voiceless shadow. His scream tore from a squawk to a full-throated screech. Then the darkness consumed him. Samut crested the dune and paused, looking back for Nakht. She froze at the sight of the looming monstrosity, mouth agape as the shadowy horror touched her friend. She heard his soul-rending screech as he instantly withered and decayed, drying into a lifeless husk. An anguished cry escaped her, but then Djeru was tackling her, sending the two tumbling down the far side of the dune, sprays of sand flying as they rolled to a halt at the bottom. There, the two stayed, hearts pounding, half buried in the sand, listening as the sounds of the horrors they witnessed slowly faded away. Only when the larger sun peeked over the horizon, and the only sound that reached their ears was the whistle of the ceaseless wind, did they pick themselves up and run, full speed and desperate, back toward the city. Time passed in cascading waves, burying that moment deep within the hearts of the two children. Yet from the seeds of their pain, divergent thoughts and questions grew, bearing vastly different fruit. One heart, hardened by the sacrifice it witnessed, found deeper faith in the words of the gods, the protections promised and the chance at a meaningful death. The other, torn asunder by the senseless loss, took up the mantle of doubt and questions, of seeking solace and clarity in the past rather the ceaseless march toward the future and the After. And so time swept by, relentless and steady as the Luxa. Children became young adults. Disciples became initiates, bound on the path of the Trials, as decreed by the God-Pharaoh and upheld by the gods. Yet even as they journeyed forward through the path laid out before them, neither forgot their trespass as children. 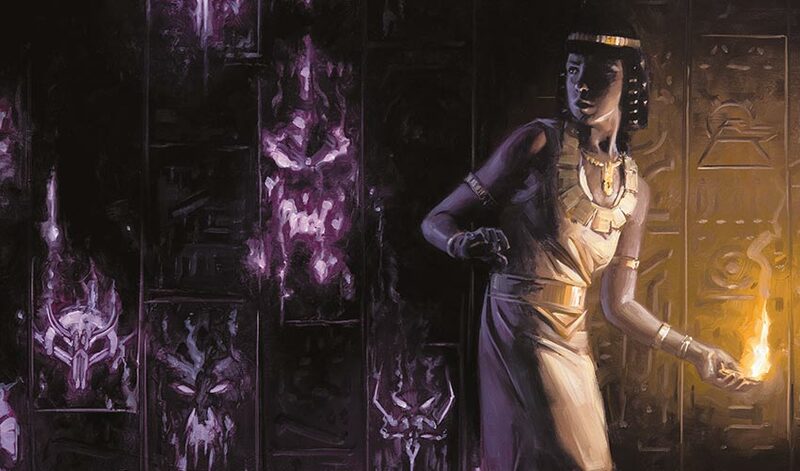 For Samut, her search for truths long forgotten drew her back, time and again, to the mural she shared with Nakht and Djeru. When the dull ache of her memories drew fresh pain, when the hollow loss of her friend bubbled to the surface, she would dive deeper into the ancient, abandoned parts of Naktamun. Fragments of what they witnessed outside the Hekma, tantalizing half-remembered glyphs from ruins she could no longer reach, flitted at the edges of her understanding. With each new piece of the past she found, her questions about the Trials and the true nature of the gods deepened. And so she spent as much time among the stones as she did among her fellow initiates, seeking with the borrowed curiosity and hunger of Nakht, striving desperately to bring into flesh and bone the dance and motions of a secret history. 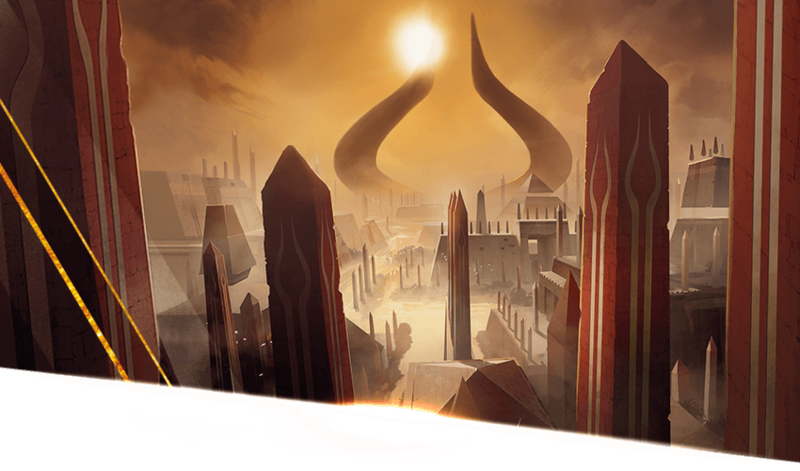 That was what led her, on one fated day, as the second sun drew closer to its final zenith between the horns of the promised God-Pharaoh, to a sealed chamber deep within the halls of Bontu's Monument. There, where no initiate was to tread, and where even Bontu had forgotten its existence, she discovered a glyph she had not seen since her journey on the sands. In an instant, memories of the forgotten shrine in the desert flooded back. As Samut surveyed the rest of the wall, depicting great and terrible destruction, cold realization seeped into her gut. We are not the trespassers, barred from the desert. The God-Pharaoh is the Great Trespasser. Not of this world, born elsewhere, he arrived then left, and in his wake we struggle for meaning. He did not save us from calamity. All the childhood stories, all the myths of the God-Pharaoh, of his birth from chaos, his bringing of order from destruction, of his promised glorious return, rendered into sharp clarity, the truth cutting across Samut's heart and drawing blood. The people had been fooled. The truth had been abandoned. The gods had been lied to—or somehow made to forget. She had to warn them all. As she left the chamber, sprinting with otherworldly speed, a dark magic slowly flickered to life across the runes. Outside, in the sky, the red sun crawled ever closer to its final resting place.